Sleepy Birdy, originally uploaded by QuakerVille. I love taking photos of parrots, especially Quaker Parrots. Several times a year Jo, my wife, and I canvas the area to see the wild Quaker Parrot environment and take a loose count and evaluate the nests and areas where the nests are located. 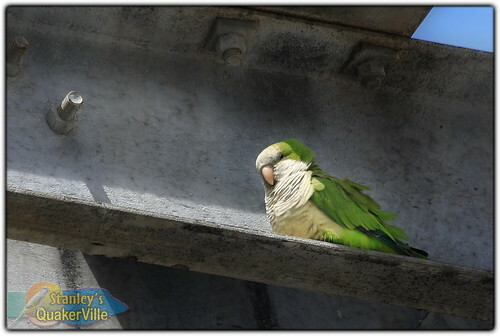 This particular spot is located in a fairly densely populated area in Deerfield Beach, Florida but the birds have been living here for as long as 15 years.